The federal lawsuit filed after Stewart Dolin’s death is now set to go to trial in March. Widow Wendy Dolin is suing drug maker GlaxoSmithKline, alleging the company failed to adequately warn patients of the sometimes-deadly side effect akathisia, a disorder induced by some medication that causes extreme inner restlessness and can drive the sufferer to violence and/or suicide. Dolin says akathisia caused her husband’s death. GSK has denied all wrongdoing in connection with the case. Wendy Dolin, in the meantime, founded an organization dedicated to spreading information about akathisia in specific and medicine-induced suicide in general. MISSD, or The Medication-Induced Suicide Prevention and Education Foundation in Memory of Stewart Dolin, produced this video on the warning signs of akathisia. That's the number of generic Paxil (paroxetine) tablets Chicagoan Stewart Dolin took, as prescribed, in the days before he took his life in the summer of 2010. A small number of prescription meds his widow now alleges in a lawsuit triggered his suicide, rather than alleviate his anxiety. "If you ask anyone who knew him, he was laid back, high on life, so there was this unbelievable disconnect between how he lived his life: a beautiful man, a beautiful life. The tragedy and violence of his death... it was, it just didn't make sense," his wife, Wendy Dolin, told NBC5 Investigates. What Wendy Dolin learned about her husband's death led to her battle on two fronts: both inside a courtroom, and in a foundation she launched in his memory to educate the public about a little-known side-effect of common anti-depressants. Dolin's lawsuit, now in federal court in Chicago, represents a rare victory for a plaintiff in her position, and has the potential to change the prescription drug landscape for consumers. 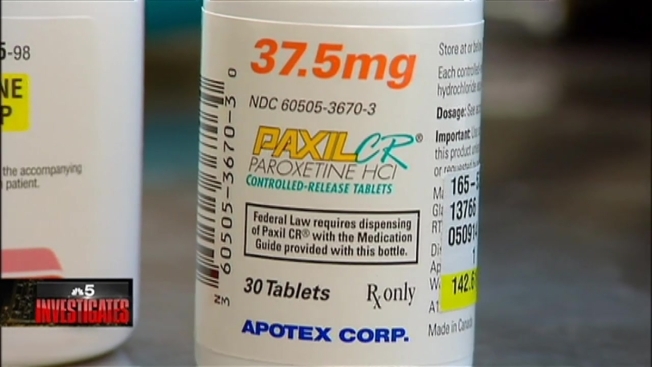 The case alleges the warning on the bottle of generic Paxil prescribed to Stewart Dolin was inadequate because it did not contain the risk of increased suicidality for adults over the age of 24. It also alleges that Paxil maker GlaxoSmithKline has known of the increased risk and suppressed warnings about it for years. Dolin's lawyer, Brent Wisner, says she -- like many plaintiffs who allege harm caused by an insufficient warning label on a generic drug -- finds herself in what is referred to as the "donut hole of liability." "That's where you have the generic maker on one hand saying, 'We don't know about these risks. We can't be held responsible for them... plus, we can't change the label,'" Wisner told NBC5 Investigates. "And the brand name makers are saying, 'Well, we didn't make the pill.'" By law, generic drug makers are not permitted to change the labels produced by brand name makers. They have to duplicate the language word for word. When a consumer alleges harm by a generic drug, they are in a tough spot: the warning they allege is insufficient was not produced by the company that distributed the medication. Many cases against both the brand name maker and the generic maker are dismissed. But in February, Dolin's case against GSK was allowed to go forward. "The label as it existed was not sufficient," Wisner said. "In fact, it says the risk of suicide does not extend beyond the age of 24. That's in the Black Box, the first thing you read. And that is factually incorrect and misleading." GSK did not manufacture, distribute or profit from the medication which allegedly injured Mr. Dolin. Well-settled principles of Illinois law provide that only manufacturers or distributors of the product that caused the actual injury can be held liable. That principle has been embraced consistently by courts across the country and they have rejected the same theory of liability advanced by the Plaintiff in this case. Nearly 91 court decisions, including all six Federal Circuit Courts to consider the issue have refused to hold a branded manufacturer liable for injuries allegedly caused by a generic manufacturer's product. Holding a branded manufacturer liable for its generic competitor's product forces the branded manufacturer into the role of an insurer for the generic industry, a result that would chill research and innovation. GSK is pursuing its appellate options and will continue to defend the case vigorously. In the meantime, Wendy Dolin is on a mission to bring awareness to a word she had never heard, and one that changed her life immeasurably. "One of my friends called and said "akathisia" and I said, what?" Wendy recalls. "I Googled "akathisia and Paxil" and it was like, bone-chilling. What had not made any sense was like, "Oh my God. That's what happened to Stewart." Akathisia is a little-known side-effect connected to some Selective Serotonin Reuptake Inhibitors (SSRI's) that are prescribed to treat depression and anxiety. It is described as an inner restlessness and agitation so intense that one pharmaceutical expert said "death can be a welcome result." All of which brought a heart-breaking realization to Wendy Dolin. "What I think is important for (people) to understand, is the person didn't really want to kill themselves. The drug gave them suicidal thoughts," Dolin said. "You have a man who had a loving family, fantastic children, amazing marriage -- a fairy tale marriage. He was making a lot of money -- at the pinnacle of his career. He had everything going for him. And then suddenly out of nowhere he takes his own life?" Wisner said. "It makes no sense until you learn what these drugs can do to people. They help plenty of people. We know that. But for the small percentage of people who experience this side effect, it can ruin a life." Dolin says if she and her husband had been aware of those warning signs, they could have taken action to stop the medicine and thus, the deadly side-effect. Her organization, The Medicine-Induced Suicide Education Foundation in Memory of Stewart Dolin (MISSD), aims to put "akathisia" and its symptoms on the public awareness radar, in the hopes of raising awareness and educating the public about the dangers of the side-effect. "MISSD is not anti-drug," executive director Jenna Sachman told NBC5 Investigates. "We understand and respect that these drugs help many people. But we are also committed to sharing the side effects. ... Many people, people like Stewart Dolin, have never heard them. Hearing about them....could save lives." "How can I explain this? When you were with a person for 42 years and you know them backwards and forwards and this was just not who he was... and when you read about this ... that's what motivates you. If this can happen to someone like Stewart, I don't think anyone is immune," the widow said.